Today is our seventh wedding anniversary. They say the traditional gift for seven years is wool or copper. We're going for bacon. 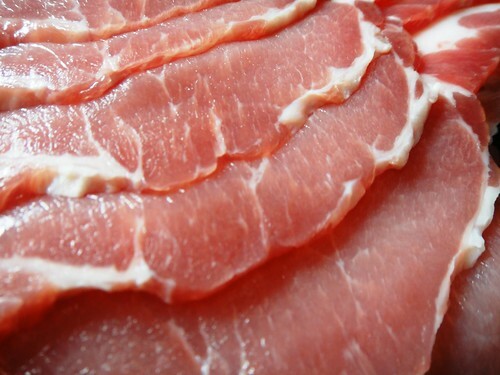 Real bacon - proper dry-cured stuff that won't shrink or exude white goo. Fried till crisp around the edges, and slapped in a buttered floury bap, toasted on the inside only to give it secret, unexpected crunch. 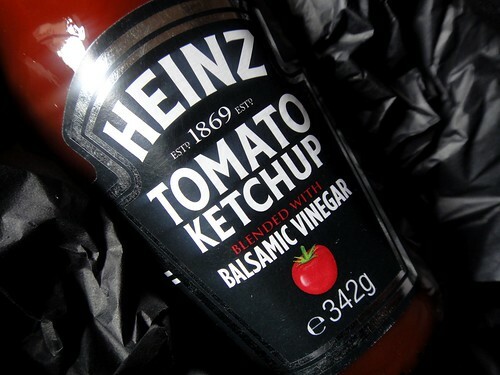 Our condiment of choice has always been ketchup, but today we will fancy it up with Heinz Balsamic Vinegar Ketchup - a fruitier, tangier version, not unlike tonkatsu sauce. We will sit in bed with our bacon butties and mugs of builder's tea, and we will feast, and we will not worry about crumbs. Congrats on the seven year anniversary! I'll need to try that ketchup spiked with balsamic one of these days! but how did you decide who went and grilled the bacon? or did you invest in a personal valet for the day? Woo hoo, seven years . . . and oh my, did that bacon bap look scrumptious! Enjoy the day lazing on a Sunday afternoon. what no seven year itch? I imagine you in a white billowing dress standing over a subway grill in New York... NO?... shame... happy anniversary! Happy Anniversary! What a brilliant way to celebrate. Those bacon butties look goooood. 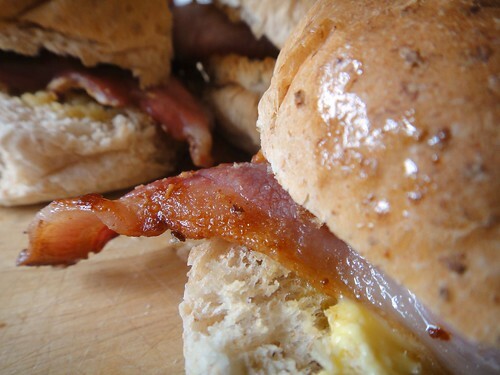 I must try that balsamic ketchup soon; in a bacon butty sounds like a good way to do so! I mostly buy Denhay bacon (also branded as Spoilt Pig in some shops) which is proper good. What did they send you? Am curious about others, as do love good bacon. For our seven year anniversary we had a seven year hitch party (couldn't really call it an itch). But the next one for us is 17th! I love ketchup and I love balsamico - I can't quite imagine them together, but shall give it a try. @Dennis K - Thanks! I hope you can get the ketchup in the States! @Josordoni - Ah, cooking is a pleasure, so it was me! Thanks! @Dom at Bealleau Kitchen - Ooh no - no nasty draughts for me :) Thanks! @Kavey - ZPR sent me the premium range bacon from Sainsbury's, Tesco and M&S. All pretty good - the Tesco's was Richard Woodall bacon and shrank the least and had marvellous texture, the M&S had the best flavour. I'd happily buy either again. Sainsbury's was the most impressive in the packet, but gave the most disappointing result. @Pavel, Su-Lin - Thanks guys! @Ute - The balsamic ketchup is really good - like HP but not as vinegary. Happy (belated) Anniversary! Bacon in bed and not worrying about the crumbs. Now that's teh right attitude (I can't do the whole crumbs-in-bed ting, drives me up the wall in an anxious frenzy). The only thing I'd change for me (other than the crumb thing *shudder*) would be the ketchup for chilli/sweet chilli sauce. The only thing to have on a bacon butty. I hope the rest of the day was equally fun, easy and decadent! @Betty Herbert - Thank you kind lady! @The Ample Cook - Awww, that's so lovely! Happy belated anniversary wishes to the both of you! Ah bacon it makes everything better there is no food well maybe a victoria sponge that does not benefit from bacon. I have recently started curing my own bacon and the difference is amazing.